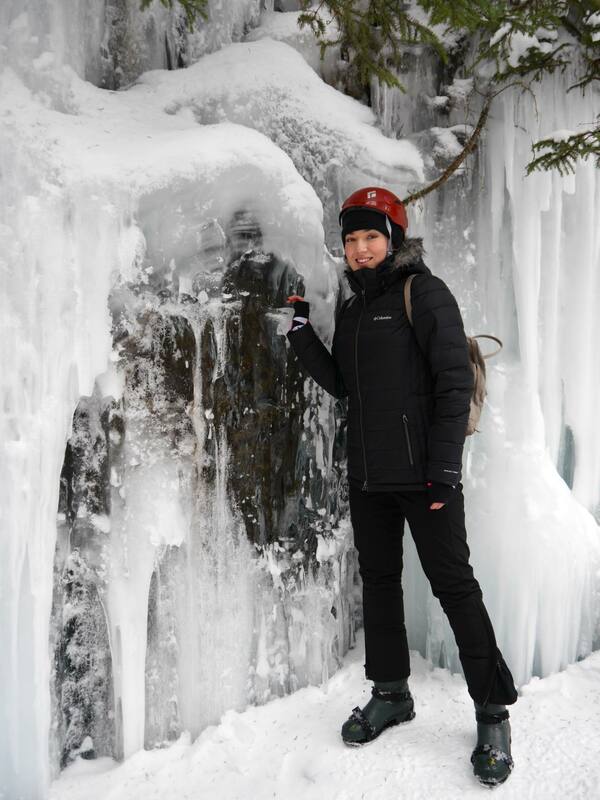 The most magical and memorable winter activity we did in Alberta had to be an ice walk through Maligne Canyon in Jasper National Park. 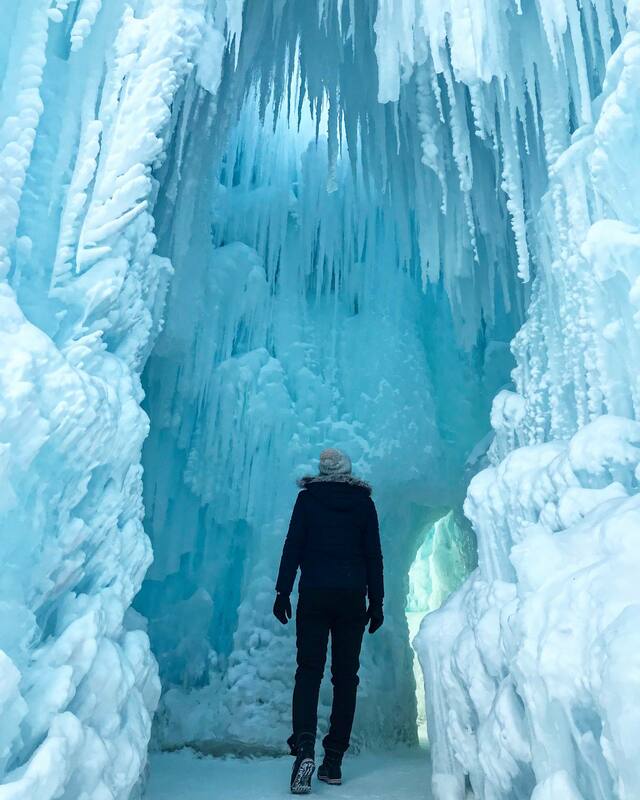 Maligne Canyon is the deepest canyon in the whole of the Canadian Rockies and in winter it becomes a spectacular frozen cavern, just waiting to be explored. 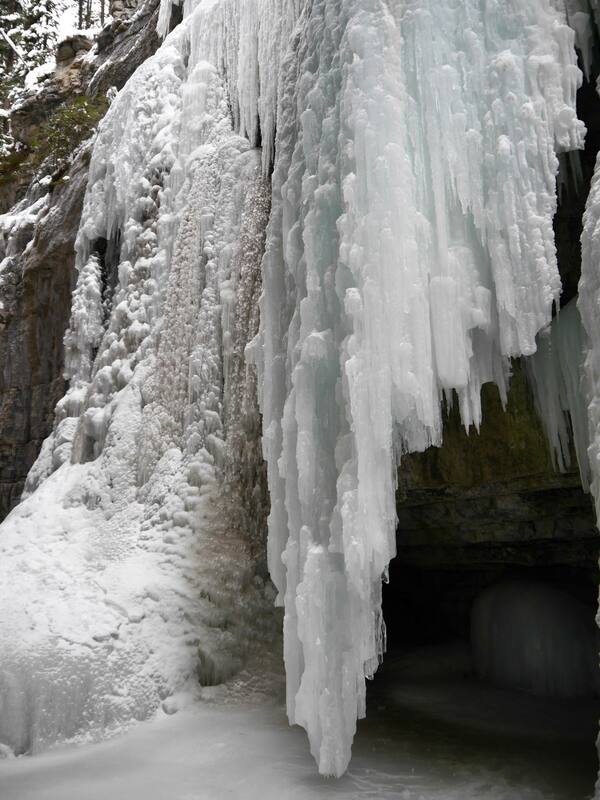 The waterfalls turn in to natural ice sculptures and the riverbed is frozen in time. 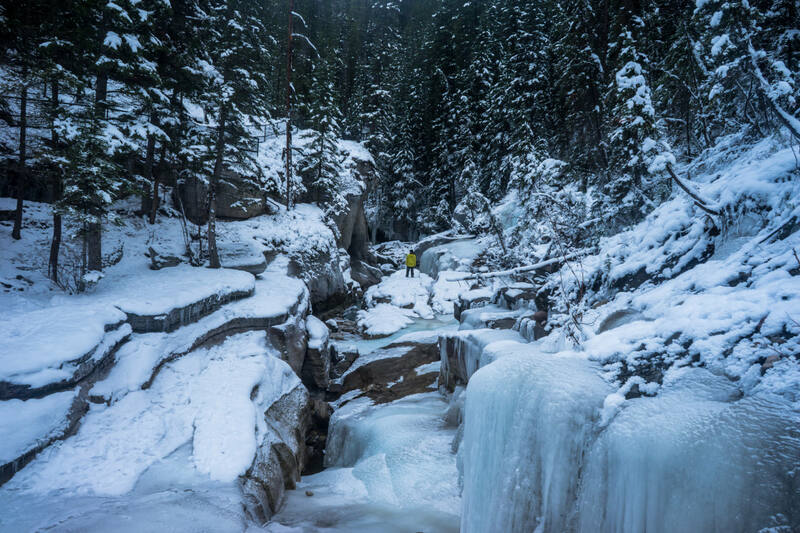 You can also try your hand at ice climbing in Maligne Canyon, but every trip here in winter should be done with a qualified guide. The guides pick out a safe route for you to walk through the canyon and check the ground is solid enough with an ice pick. You’ll be given cleats (grips on the soles of your shoes) and thermal wellies to stop you from slipping. 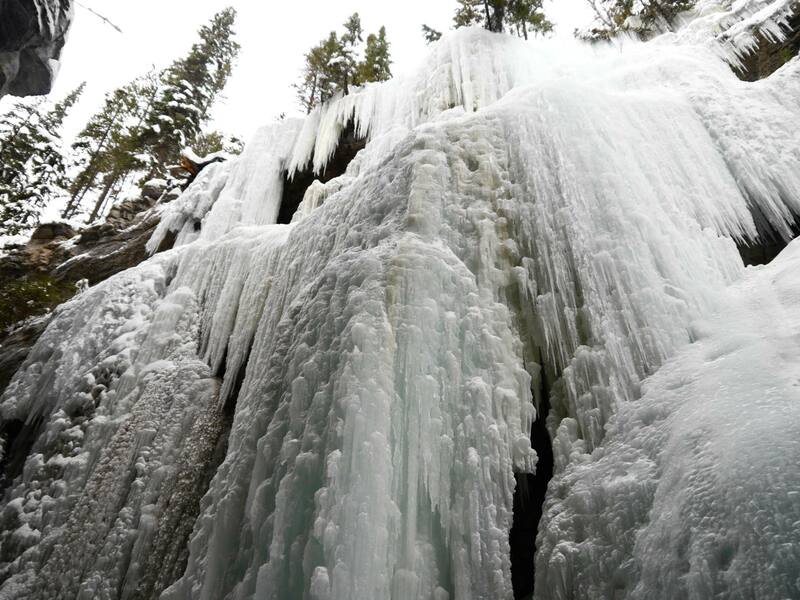 Watch my video below for a closer look at Maligne Canyon’s Ice Walking experience. Alberta is full of lakes of all shapes and sizes, but one of the most famous has to be Lake Louise. Partly thanks to the iconic Fairmont Chateau Lake Louise, but mostly to the stunning backdrop of mountains that surround it. Skating on a frozen lake is an entirely different experience to being on a rink. There are no sides to hold on to, and the surface is a little more bumpy, but it’s real! 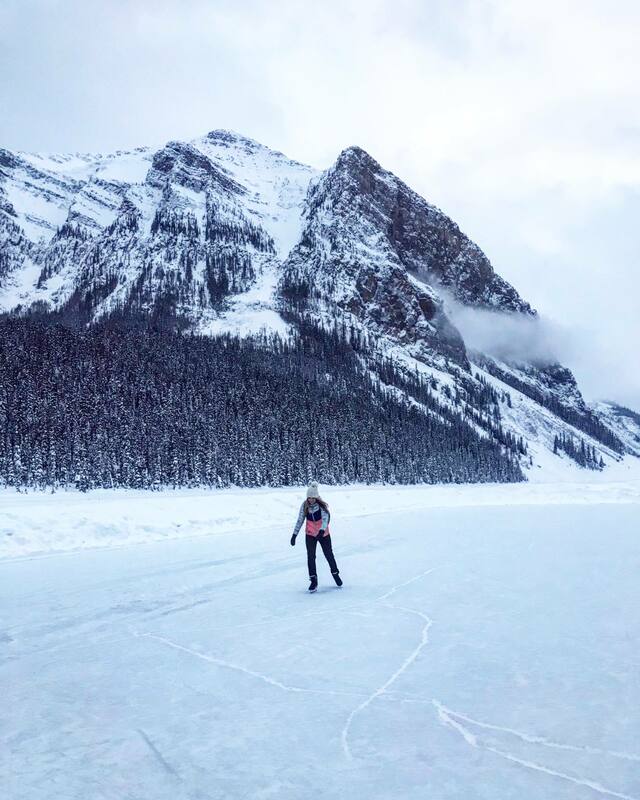 I don’t know why, but skating on a frozen lake really blew my mind, and there is nowhere better to do it than at the famous Lake Louise. Of all the things to do during Winter in Alberta, ice skating on a frozen lake is a must. Need to Know: You don’t have to be a hotel resident of Fairmont Chateau Lake Louise to go skating on the lake and you can hire skates from the ski-hire shop inside the hotel. 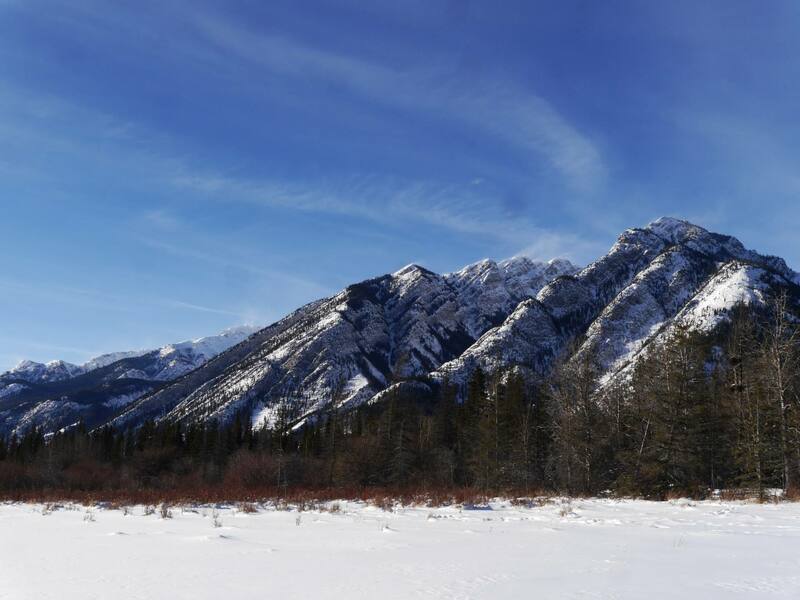 Just because you don’t ski doesn’t mean you can’t enjoy Alberta’s fantastic ski resorts. 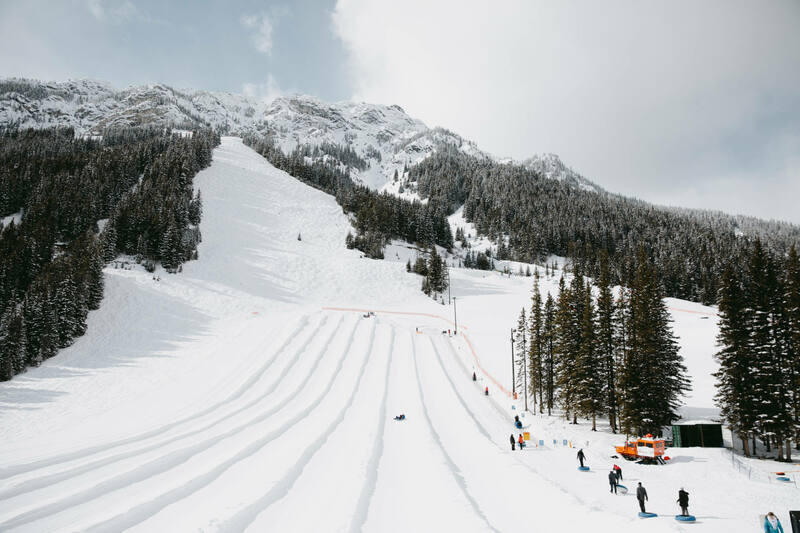 Mount Norquay is Banff’s main ski resort and as well as its many perfectly groomed pistes, it’s home to a tubing slope. The slope basically looks like flooms made out of snow, which you shoot down in a large inflatable ring. We did the tubing during our time in Banff and it was so much fun. The flooms vary in gradient so you can start on an easy one and work your way up to the steepest! Need to Know: Expect to get some snow spray in your face so sunglasses (or better yet ski goggles) are definitely recommended. 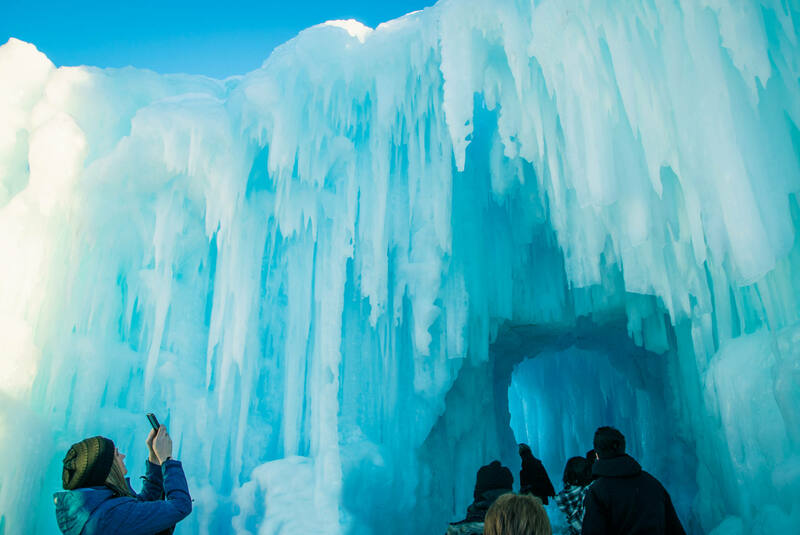 A visit to the Ice Castles is an absolute must if you’re planning a visit to Edmonton in winter. 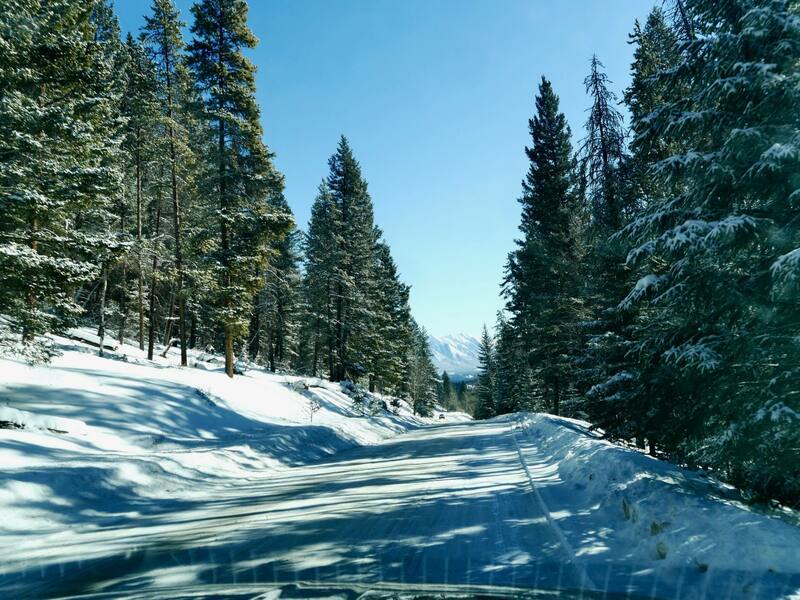 This was where we started our winter road trip through the Rocky Mountains and it was a perfect introduction to Canadian life. 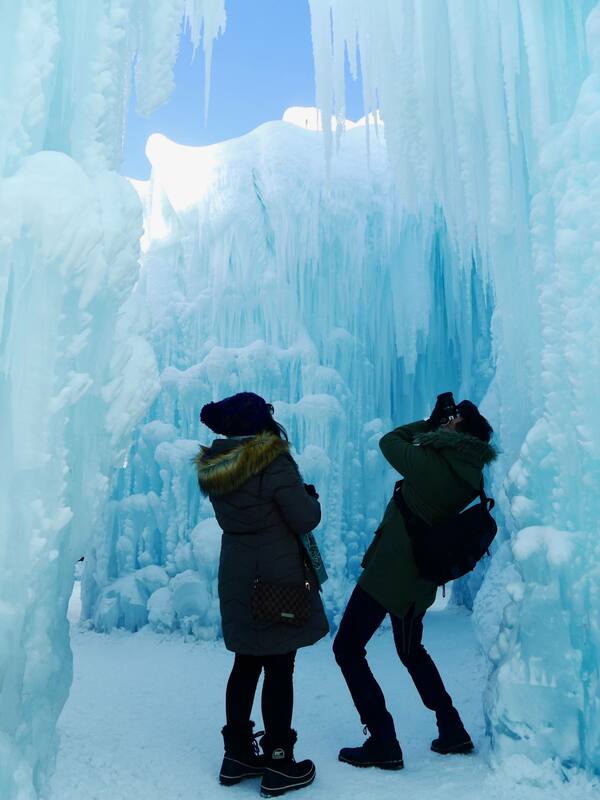 The Ice Castles are a labyrinth of manmade tunnels, slides and caves that you’ll find yourself getting lost in. The icicles are insanely beautiful and have a vivid blue colour, making for the perfect photo opportunity. Both kids and adults can enjoy the slides and there is a central fire pit to warm up chilly hands and feet. 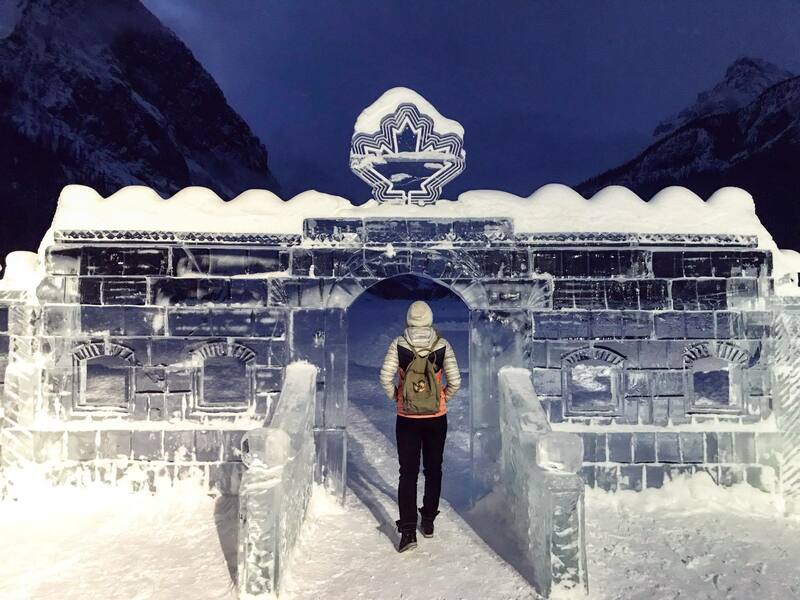 Need to Know: The open dates vary from season to season depending on the weather, but in 2018 Edmonton Ice Castles ran from January to 10th March. It’s worth checking the official website for the seasonal opening dates. Advance booking is essential. 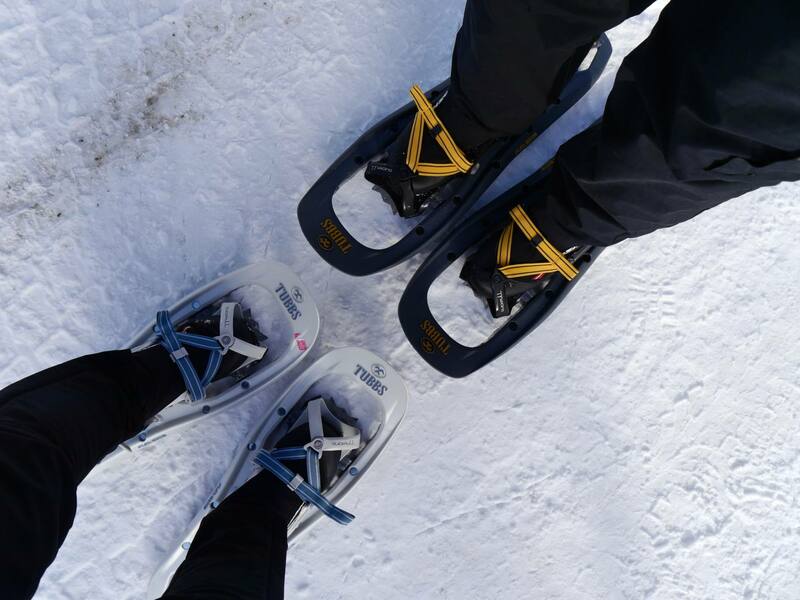 Snowshoes have evolved a little since historic Eskimos times, but they still work in exactly the same way. 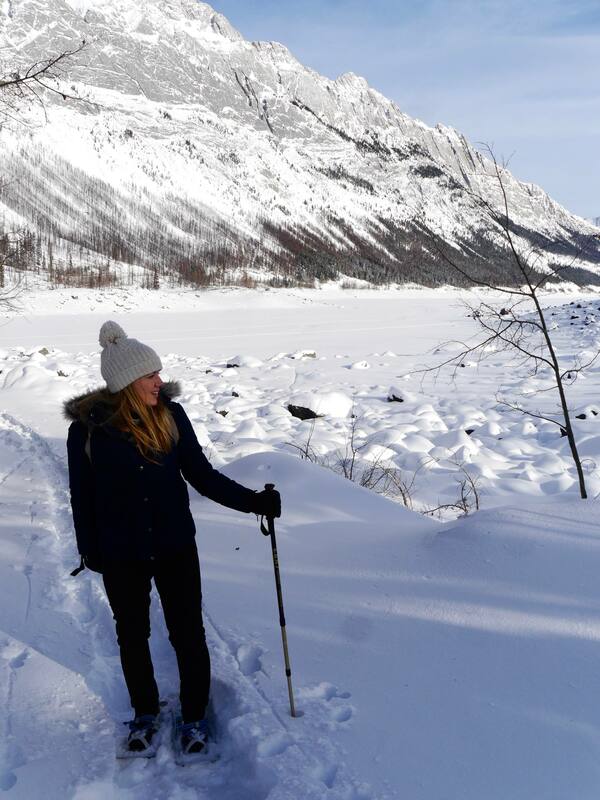 The large surface area helps you to walk through incredibly deep snow, opening up a whole new realm of adventures! 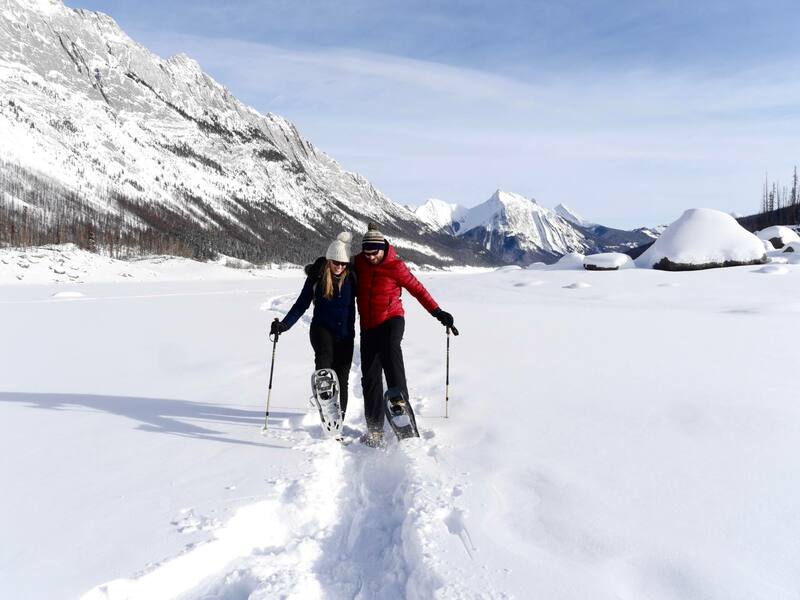 Snowshoeing experiences are widely available across Alberta’s National Parks (including Banff and Jasper). We tried it in Jasper National Park and walked across Medicine Lake, which had frozen over and had almost a meter of snow on top of it. It’s a strange sensation at first, but a great experience. 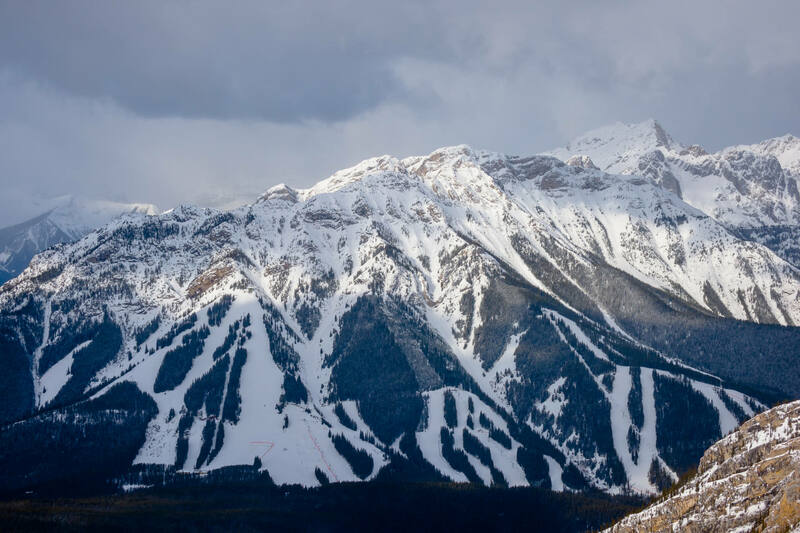 If you do ski or snowboard and want to include it in your winter activities, be sure to pay a visit to Marmot Basin in Jasper National Park. Marmot Basin is a 20 minute drive from the town of Jasper and is one of the most laid back, unpretentious and crowd-free places I have ever skied. 7 lifts spread across 1,700 acres of a skiable terrain and both beginner and advanced skiers are well catered for. 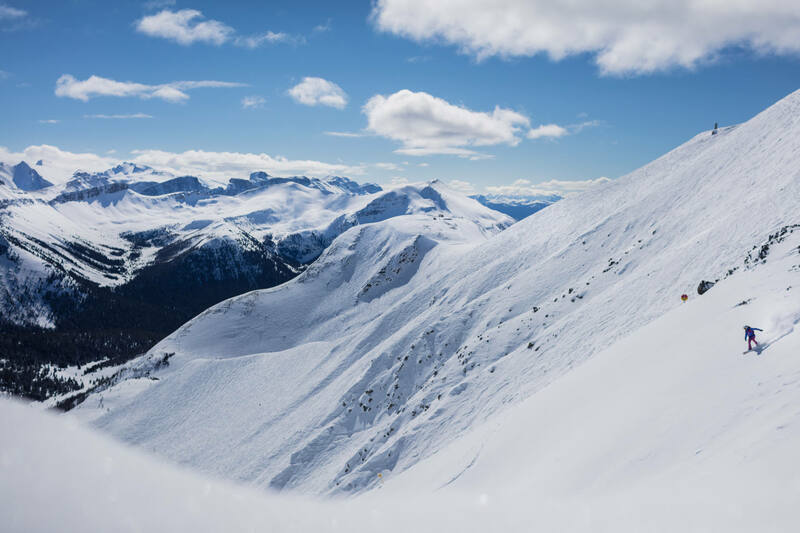 The ‘Tres Hombres’ area is new for 2018 and offers 45 acres of advanced and expert off-piste skiing. Marmot Basin was an unexpected highlight of my trip, but its only worth visiting if you want to ski or snowboard. The quiet slopes and gentle runs also makes it a great place for beginners to give skiing a try for the first time. 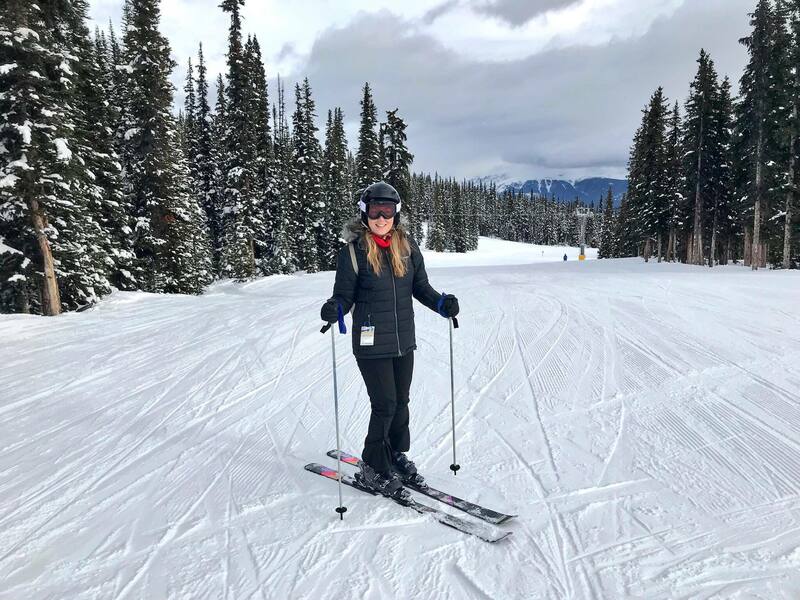 Need to Know: There are no hotels in Marmot Basin, so it’s best to stay in Jasper and just come up to the mountain for the day. 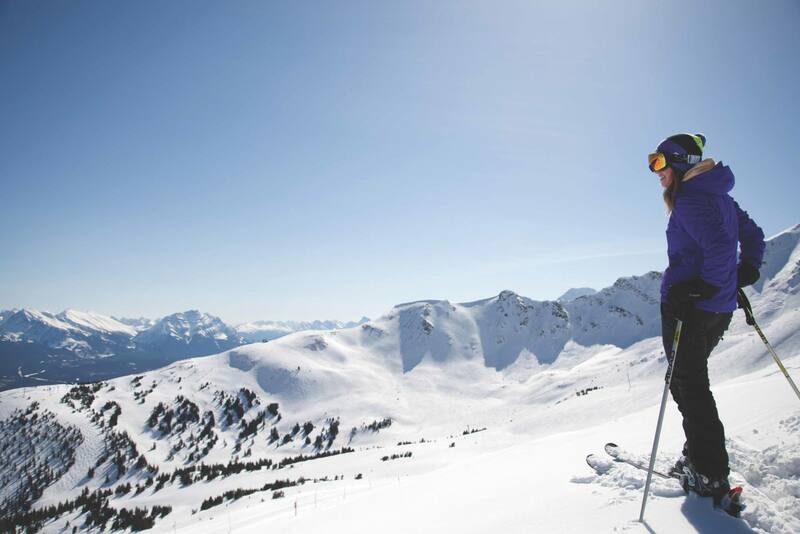 Check out Marmot Basin Ski School for expert tuition on the slopes. Daily lift passes cost $95 CAD / £52 per person. 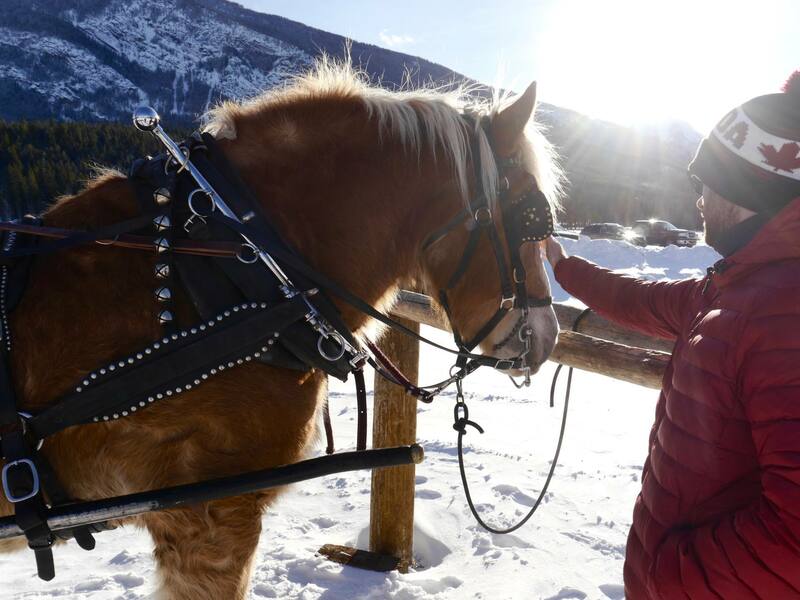 For something a little less exerting, head to Warner Stables in Banff for a unique horse-drawn sleigh ride experience. 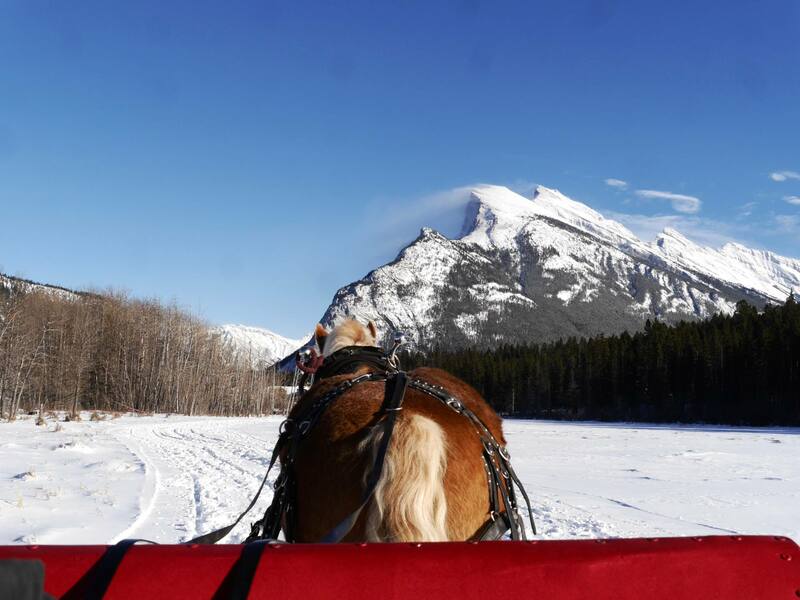 Banff Trail Riders offer romantic sleigh rides for two or larger family sleigh rides pulled by two or more horses. Starting at Warner Stables, the ride will take you through enchanting woodland and past some of Banff’s most striking mountain views. We snuggled under a blanket on a sleigh ride for two and just took in all our surroundings. 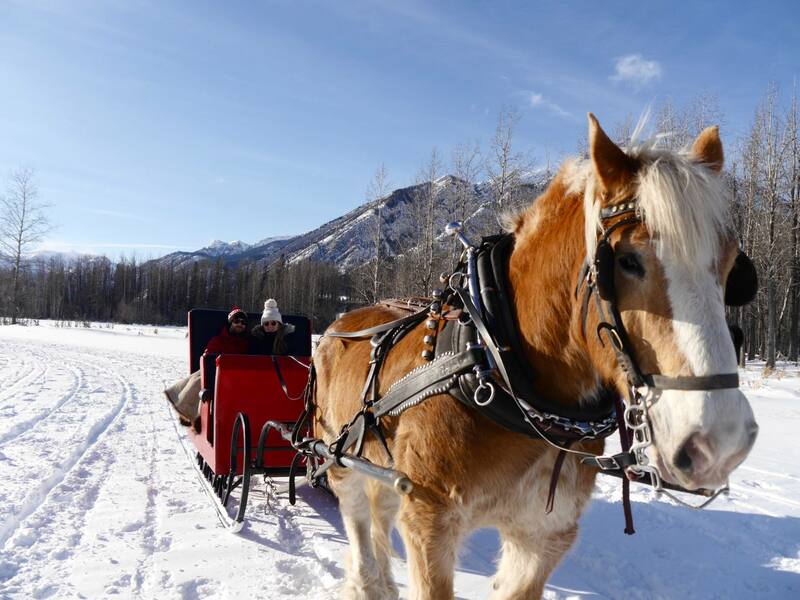 A 45 minute sleigh ride package costs $95 CAD / £52 per person. Ice climbing is an incredibly popular activity in Alberta and although I didn’t try it myself, I loved seeing other people giving it a go. 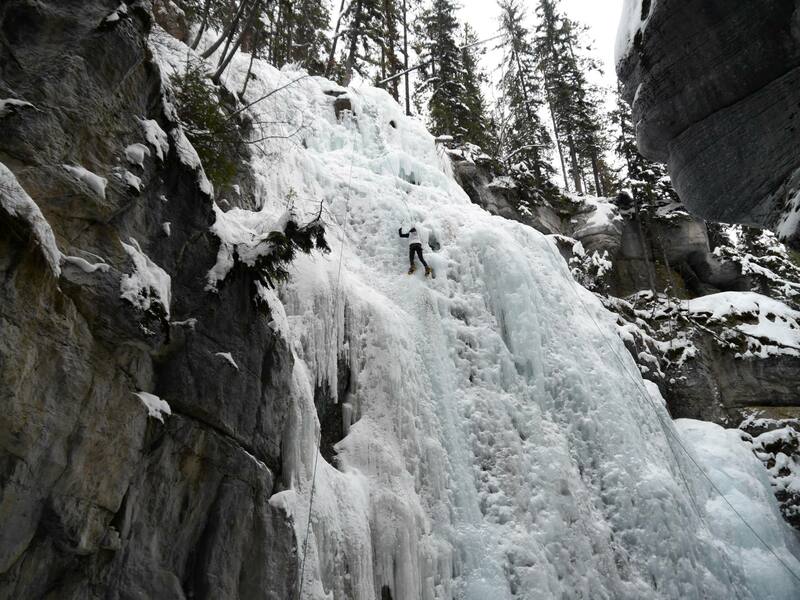 I saw beginner climbers in The Maligne Canyon and more advanced climbers on a huge glacier on the Icefields Parkway. I think it would be an incredible adrenaline-fuelled activity and definitely something to tell the grandkids about! Just be sure to go with a reputable guide who will know the safest place for you to try it. 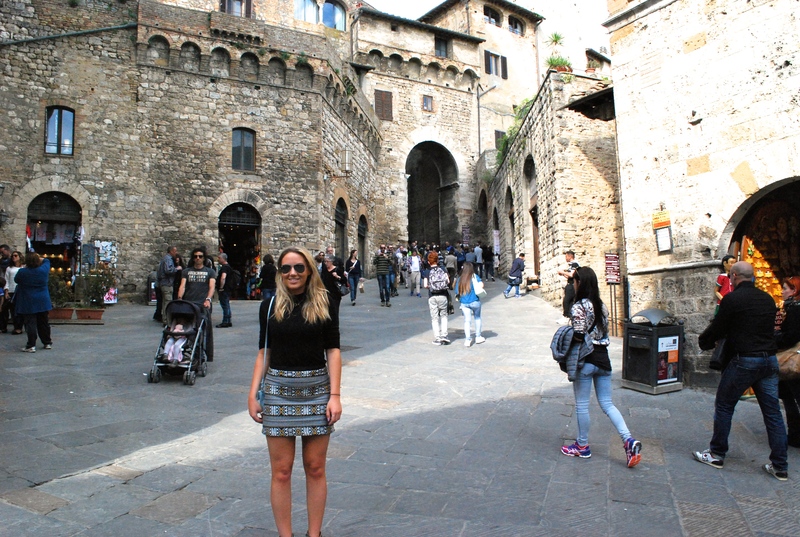 This blog post has been written as part of a sponsored collaboration with Travel Alberta. All words and views are my own. any advice on who you all used for airlines and where you all lodged at? This looks incredible! Canada has been top of my bucket list for ages and I’m desperate to go but for some reason I’d never considered going in winter… I think your post has changed that. These photos are stunning, it all looks magical! 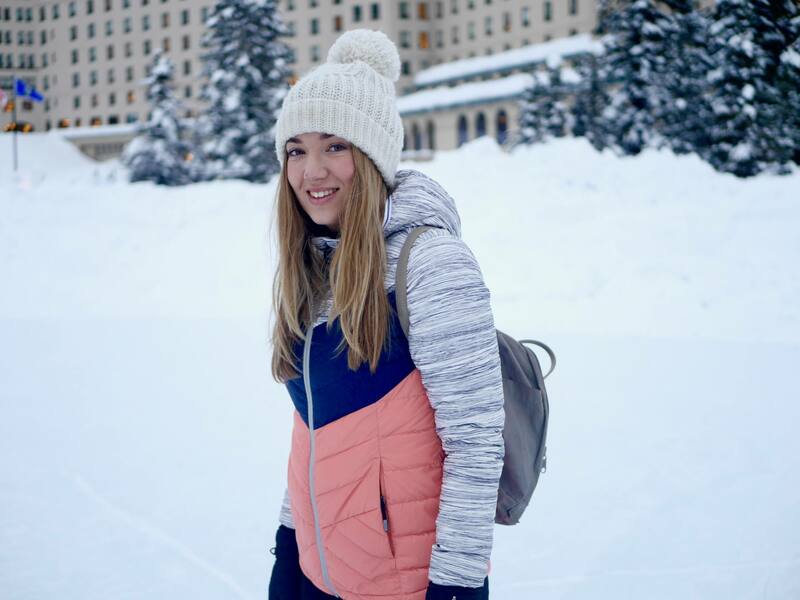 Such a magical holiday with so many fabulous experiences, I absolutely love the sound of the ice skating on Lake Louise!